Denis Dale wraps up recent events on the national senior amateur scene, including the annual Australia Vs NZ clash, Queensland Senior Amateur, Gold Coast Seniors and more. The New Zealand Senior team has continued their recent dominance over Australia with their narrow win in the 2015 Sanctuary Cove Trophy played recently at Sanctuary Cove Golf Club in Queensland. This annual event began in 2007 and is played using the same format as the Ryder and President Cups and is just as exciting and prestigious an event to the twenty four golfers who compete every year. Australia had gone into the final twelve single match play games with a two point lead after an excellent display in the fourball and foursomes matches. Most of the singles matches were very close but Australia just failed to take charge over the closing holes that often make the difference between winning and losing in matchplay golf. Overall there was only one match in it with the Kiwis winning by 13 points to 11. After nine years of competition the score now stands at six wins for New Zealand and three wins for Australia. The next match between the two traditional rivals will be in New Zealand at the Royal Wellington Golf Club in February, 2016. Immediately preceding the Sanctuary Cove Trophy will be the New Zealand Senior Amateur Championship at the nearby Paraparaumu Golf Club. The 2015 captain Tony Kennings will lead the team again and has already begun plans for a winning result and a chance to hold the trophy high and bring it back to Australia. The Sanctuary Cove Trophy is a great tournament and is still the pinnacle of senior golf in both countries. Australian captain Tony Kennings (Left) congratulates NZ captain Barry Shannon. The 2015 Gold Coast Senior Classic was played over three of Queensland’s best courses – RACV Royal Pines, The Glades and Links Hope Island. Certainly three days of wonderful golf for the large field of senior golfers taking part in the fourth playing of this event. 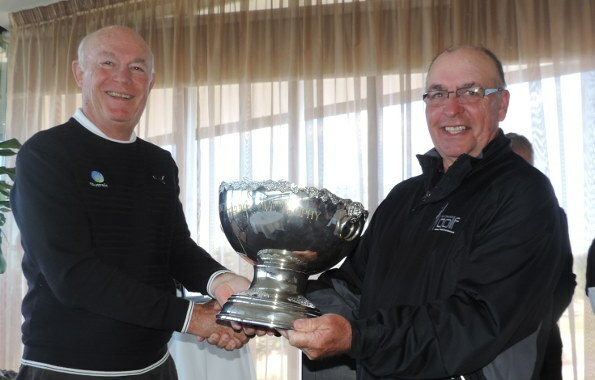 The winner of the major trophy was leading Kiwi senior Frank Borren who had stayed over after representing New Zealand in the Sanctuary Cove Trophy the previous week. He was joined by several of his team mates and they certainly had a successful and enjoyable week. Entering the final round Borren held a one-stroke lead after opening rounds of 74-71. He played the championship level Links Hope Island course like the experienced campaigner he is to return an excellent final round of 73. He defeated fellow Kiwi representative Michael Barltrop by three shots. Borren has played quite a few times in Australia and it was pleasing to see this very good player break through for a win in Australia. In finishing second it was yet another high placing in an Australian Senior Ranking event for Michael Barltrop (72-74-76=221). Barltrop is a regular traveller to Australia enjoying the challenge of quality competition played on quality courses. His continued success sees him placed well inside the top ten on the current Australian Senior Ranking table. Third place went to another New Zealand visitor Rodney Barltrop who finished with scores of 68-78-80=226. Barltrop was also the leading Over 65 player and his successful tournament included the best round of the tournament with his opening score of four under par 68 at Royal Pines that equalled his age. In recording his 68 he had the thrill of a hole-in-one on his final hole – that’s the way to end a good round! Rodney Barltrop is no stranger to Australia having won the Australian Senior Amateur Championship three times. It was another very successful Gold Coast Senior Classic highlighted by excellent organisation, three great courses and also the welcome participation of many of New Zealand’s best senior golfers. Heading into the final round of the 2015 Queensland Senior Amateur Championship, played at Southport Golf Club it was a vey tight leaderboard with 10 players within five shots of pacemaker, New Zealand’s Barry Shannon. After the first nine holes of the final round Queenslander Peter Hannah, two behind overnight, had taken a narrow lead from Victorian Ian Frost with Barry Shannon, Sam Christie (Qld) and Darryl Hearsch (NSW) all within three shots. Like most major tournaments this one would be decided on the final nine by those who handled the pressure the best. When both Hannah and Frost double bogeyed the long par 3 12th hole the title race was even closer with all the contenders now in with a real chance. A crucial turning point came on the very next hole when Frost made a birdie four to Hannah’s double bogey seven. However, Shannon and Christie weren’t to be denied as they also birdied this hole. The closing four holes would decide the winner and they are some of the best and most challenging on the Southport course. Christie finished bogey,double bogey to eventually share runner-up with Shannon who also found trouble bogeying his final four holes. Frost’s class as the highest ranked Australian Senior in the field shone through and he parred his way home to win by a surprising five strokes. Peter Hannah finished alone in fourth place and evergreen Redcliffe senior Col Hallam was his usual consistent self in finishing in a tie for fifth with Greg Duguid and Darryl Hearsch. This was the first Australian Senior Ranking event victory for Frost but it will certainly not be his last. A strong hitting senior Frost is looking to play more events and will be one of the favourites in the two South Australian events to be played in early September and the Australian Senior Amateur Championship that follows later in the same month. Barry Shannon had a successful tournament and goes back to Wanganui, New Zealand with second place in a major Australian tournament. Sam Christie has won several senior titles already including an Australian Senior Championship and a NSW Senior Championship and it is pleasing to see him back playing in major events. Home course knowledge paid dividends for Southport member Ray Geary as he claimed the Overall Nett prize with a 54-hole total of 214 from his handicap of seven. He defeated Darryl Hearsch (221 from handicap 4) and Barry Shannon (222 from handicap 3) and also combined with fellow members Jeff Wood and Tony Irvine to win the Club Teams Challenge. The Southport course is a perfect venue for a senior tournament as it relies more on accuracy and strategic play than sheer power and once again the large field was generous in their praise of the course. The 2015 Coffs Coast Seniors was changed slightly from previous years with the two rounds on the Coffs Harbour course and the Bonville course being separate events in the NSW senior Order of Merit competition. There was still an overall 36-hole competition with the winner receiving the Coffs Coast Championship title. The Coffs Harbour Seniors played on a Friday attracted a good field and was won by Belmont senior Garry Barber with an excellent round of 72 on this very challenging course. One stroke away was Bayview’s Dale Tapper, the current leader in the 2015 Golf NSW Senior Order of merit competition. The following day saw most of the same golfers (plus a few extras who could not make the previous day) ready and keen to enjoy a game in the 2015 Bonville Seniors. One of the most spectacular courses in the country Bonville regularly attracts golfers from interstate and overseas keen to appreciate the picturesque course and the championship layout. The winner was Bayview’s Dale Tapper who continued his good form by recording a par-equalling round of 72. The talented Tapper was in sensational form and commented that it was “the best I have played for many years” in firing six birdies on his way to winning the event by three strokes from Twin Creeks senior Denis Dale and Forster-Tuncurry’s Greg Ellis who tied for second place with 75. Tapper was a six-stroke winner of the overall 36-hole Coffs Coast Seniors Championship with his rounds of 73-72=145. Second place went to consistent Cabramatta golfer Greg McKay with rounds of 75-76=151. Greg Ellis took out third place on a countback after rounds of 80-75=155. Still on the north coast and the 2015 Ocean Shores Seniors was another event to draw a very good field and it was pleasing to see New Zealand’s champion senior Michael Barltrop enter and win this event. Barltrop is one of New Zealand’s very best senior golfers and he was delighted to record his first win in a NSW Senior Order of Merit competition. Runner up was Victorian visitor Ian Frost from the Bendigo club with a round of 76 with local member Peter Ferris filling third place. Darwin visitor Tom Harold was fourth and along with Barltrop and Frost had played in the Sanctuary Cove Trophy (Australia vs New Zealand) the previous week. This trio showed their class in filling three of the top four places. Back to Sydney and the 2015 Cabramatta Seniors where a good field was ready for the challenge of one of Sydney’s more difficult courses. The winner was Twin Creeks’ member Denis Dale with a round of 74. Dale had played all his junior and early pennant golf at this club and was pleased to record his third win in this event since it began in 2007. Second place went to Vince Clark (The Lakes) with a round of 76. Denis Dale continued his recent good form with a win in the 2015 Carnarvon Seniors after an excellent round of one under par 71. The Carnarvon course was in wonderful condition, the greens at their very best and the course setup well suited to senior golf. Second place went to Manly’s Darryl Hearsch on 73 with Forster-Tuncurry visitor Alan Symes third on 75. 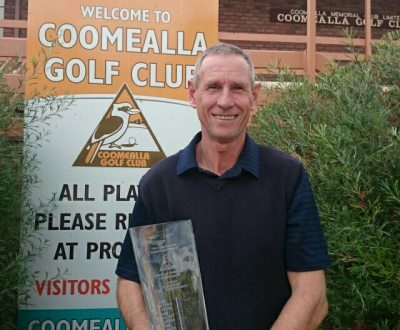 Local member Greg Rhodes has claimed the 2015 Coomealla Senior Open by an incredible 28 shots. Rhodes fired three rounds of 67, 68 and 72 (par 72) around his home course to win his first ever event in the Doug Bachli Senior Order of Merit competition for the state’s senior golfers. Rhodes finished an amazing nine under par in claiming his first title and it will certainly not be his last. Second place went to regular Senior Order of Merit competitor Alan Bullas (Commonwealth) with scores of 76-78-82=235. Earlier this year Rhodes won the NSW Senior Amateur Championship in Orange where he finished six under par for the 54 holes and also did not have a round over par. In July Rhodes was selected in the Australian senior team to play New Zealand at Sanctuary Cove Golf Club. He performed well in this series winning two of his three matches. In the women’s Stableford section, it was fellow Coomealla member Dawn Jackson who was victorious with rounds of 37 and 33 points. One shot adrift was Jill Foster with consistent rounds of 35 and 34 points. 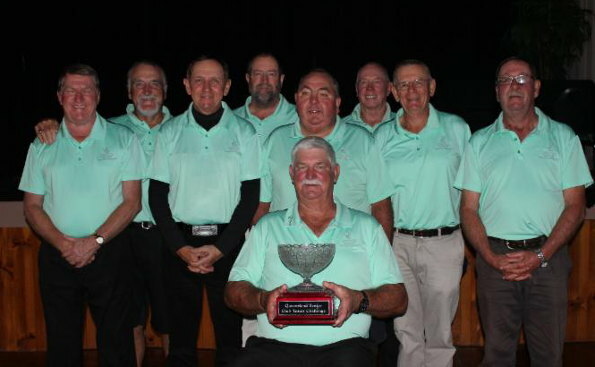 Coolangatta Tweed Golf Club – winners of the 2015 Queensland Senior Club Challenge. The Coolangatta Tweed Golf Club have won the 2015 Queensland Senior Club Teams Challenge, defeating Lakelands Golf Club seven and a half to four and a half on aggregate in the teams Match Play format. Clubs from the wider south-east Queensland region are eligible to play in this championship. The final consisted of home and away match play games at each course. It was a well-matched round at Lakelands with each team finishing on three games in the first of the home and away finals. It was all down to the second final held at Coolangatta Tweed Golf Club. After holding Lakelands to an away draw the Coolangatta team were the favourites and began very well establishing a lead in most games at the half way mark. Using their local knowledge of the River Course layout to their advantage they finished with a 4 ½ to 1 ½ victory and claimed the 2015 Senior Club Teams Challenge title, winning 7 ½ to 4 ½ on aggregate. The Coolangatta Tweed Golf Club has been the dominant club in senior pennant golf in recent years and this is another title they can add to their growing list. It is the fourth time the club has won the Teams Challenge in the last seven years. Congratulations to the 2015 team pictured left to right – Kerry Paine, Rod Dale, George Spillane, Ron Gageler, Doug Glazebrook, Dave Marshall, Phil Towle, Len Korn and Dave Morrison (seated). Congratulations also to team captains David Morrison (Coolangatta Tweed) and Michael Parisi (Lakelands) and all the other clubs that participated in this year’s Senior Club Teams Challenge Series.